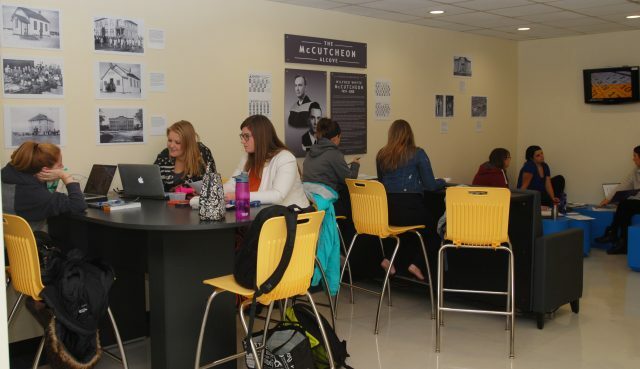 The McCutcheon Alcove in the Education Building is a popular gathering spot for students. BRANDON, Man. 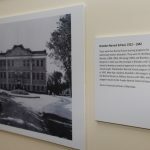 — Brandon University (BU) students are getting a history lesson when they study in the new McCutcheon Alcove. 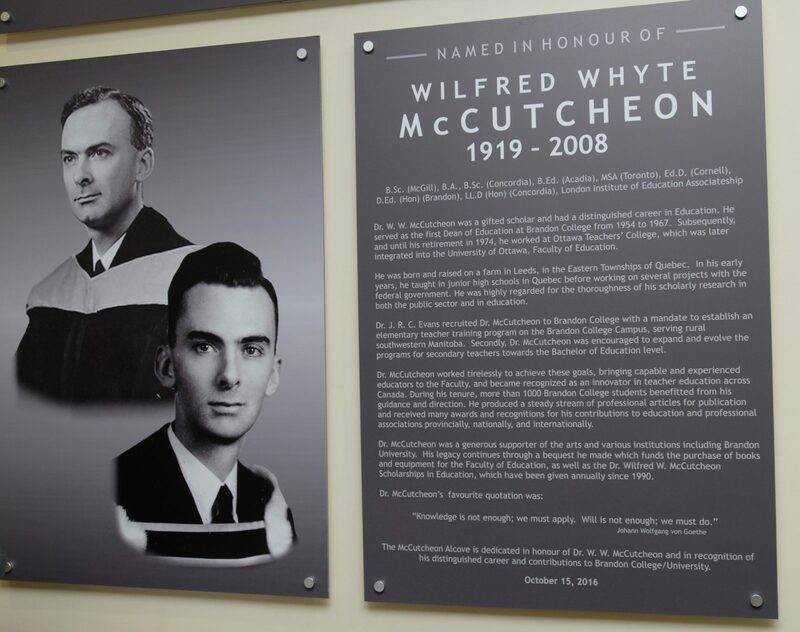 As part of this week’s Homecoming celebration, a ceremony will be held on Saturday at 1:30 p.m., to dedicate the space in honour of Dr. Wilfred McCutcheon (1919–2008), the first Dean of Education at Brandon College. The study space has been refurbished, including the addition of new furniture, with the help of $7,253 raised through an appeal to alumni spearheaded by Gerald Brown, a graduate of the Teacher Training Class program. 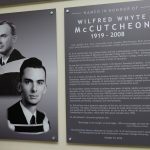 The McCutcheon Alcove also features a plaque recognizing Dr. McCutcheon’s contributions to Brandon College as well as a photo display of the Westman area’s educational heritage. “Our students have been making great use of this comfortable space to study and connect with one another,” says Dr. Heather Duncan, Dean of Education and Associate Vice-President, Research at BU. Dr. McCutcheon was recruited by Dr. J.R.C. Evans, the President of Brandon College at the time, to establish an elementary teacher training program. The Dean of Education from 1955–1967, he also worked to expand the program for secondary teachers to the Bachelor of Education level and was recognized as an innovator in teacher education across Canada. A donation by Dr. McCutcheon created a scholarship that has been awarded to Education students since 1990, and he made a bequest that funded the purchase of books and equipment for the Faculty of Education. Brown, a member of the TTC Class of 1956, which is celebrating its 60-year reunion this weekend, is the master of ceremonies for Saturday’s dedication. Dr. Duncan and BU President and Vice-Chancellor, Dr. Gervan Fearon, will both speak at the dedication. They will be joined for a ribbon-cutting ceremony by Pat Bowslaugh, another key organizer of the dedication campaign. Bowslaugh is a graduate of the TTC program at Brandon College, as well as BU’s faculties of Education and Arts. The plaque dedicating the McCutcheon Alcove to Dr. Wilfred McCutcheon. 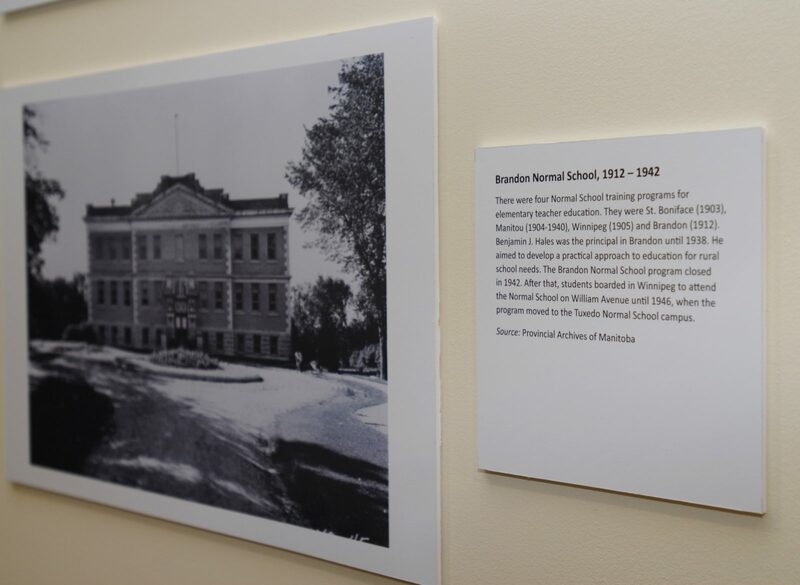 A photo of the Brandon Normal School next to a description of the school’s history.